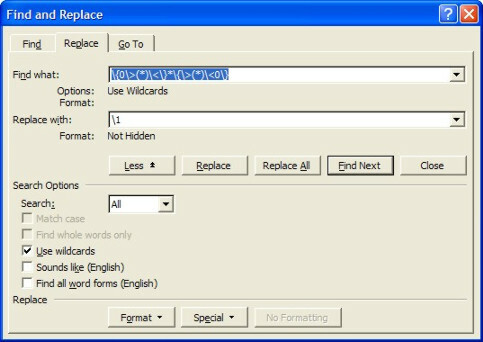 Word Find and Replace (part 2) - Translation Solutions Ltd. The button Format will let you look for words in specific formats. You can look for words with a specific font (and font size, colour, decoration …), a specific style, language, highlight…, all these things that will help you to define exactly what you are looking for. The formatting is detailed below the find box, once selected. The “Clear formatting” button refers to the formatting instructions applied with the button “Format”. If you were looking previously for word in italics and that you no longer need it, you must use the “Clear formatting” button. Wildcards. A wildcard is a symbol used to represent one or several characters, to define a pattern or to add information on a search item. The most famous wildcard is certainly “ * ”. * replaces any number of characters. If you activate the Wildcard option case and search for s*ch, Word will find and select anything that is contained between the first “s” of your document and the first “ch” thereafter. (Not just one word. Anything). s*ch would match "such", "search" but also "some real ch"eap sugar!
? replaces 1 instance of any character. If you search for “b?g”, you will get “bag” and “big”. When wildcards are on, Find is case-sensitive. "s*ch" will match "such", but *not* "Such". Additionnally, you can not look for paragraph mark using ^p. You need to type ^13 instead. Now, I am aware it doesn’t sound incredibly interesting at first sight but combined with the Replace function (Ctrl + H), you can implement a large number of modifications at once in a document. For example, you can remove all double spaces from your document with one simple find and replace. you can change a Wordfast/Trados segmented file (see CATs articles in the tutorial section) back into the original file or clean it with a single Find and Replace string. In the screenshot is a "Find and replace" command that will restore a segmented file back to the original, unsegmented file. You can also clean the file with nearly the same command. Use \2 instead of \1 in the replace box. You can use Find & Replace for a number of things, from correcting a mistake to formatting whole document. It’s just a matter of figuring out what you want to do and how you can do it. Maybe the documents use the wrong font in many parts, or the wrong language. Using Search and replace you could assign the correct language attribute or font to the appropriate parts of a bilingual document. F&R is also often useful to change the style or attribute of several items at once. Let say, you have several parts of the document that should be in bold (such as a command name). Type the command name in “Find what” and in the “Replace with”, but for the “replace with”, select bold in format/font. There are very little limits to what you can get done in Word with F&R. Learn it and train yourself. Whenever you have a repetitive task in a document, start by asking yourself “how can this be done with F&R?” You will be amazed to find out just how many painfully long modifications can be done in less than a minute with F&R. Good luck. If you have examples of useful F&R, you are most welcome to submit them.